A upper-crust phonetics professor makes a wager that he can transform a Cockney flowergirl into a English lady that can pass as a duchess. George Cukor (who also won the Oscar for direction). With Wilfred Hyde-White, Jeremy Britt, Theodore Bikel, and Mona Washbourne. Jack L. Warner (1892 - 1978), American executive producer and last member of the four Warner Brothers who started the major studio. Warner's recent works include: CAMELOT and 1776. Based on the stage play which ran for over 6 years. Numerous famous Alan Lerner / Frederick Loewe songs, including: "Why Can't the English", "Get Me to the Church on Time", and "The Rain in Spain" are memorable. 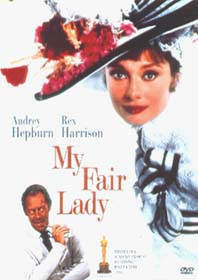 Julie Andrews had created the role of Eliza Doolittle on the stage and many were disappointed when she did not get the film role, which went to Audrey Hepburn. Marnie Nixon was the singing voice of Audrey Hepburn. MY FAIR LADY was based on George Bernard Shaw's "Pygmalion", and the longest running musical on Broadway. It was filmed excusively in Hollywood.